The South East coast of Ireland has numerous wrecks and reefs within easy distance. U-Boat Action during the First World War accounts for most of the shipwrecks in this area. There are plenty more to choose from, while the reefs off Hook Head are very popular for diving. West along the coast for about 1km. You will see the water breaking on the top of the rock on full tide and you will see the rock at low tide. This is an excellent dive, depth 10-15m, possibly 20m on the seaward side of the rock. Long gullies run parallel to the coastline and there is an abundance of sea life. A very enjoyable dive. The 3 Mile Rock is at a Depth 20-35m, an excellent dive, plenty of life and not much weed. It is a large plateau of rock approximately 15m off the bottom. You will have a very enjoyable dive at 20m all around the top of the rock. The West Rock is another plateau of rock West of Three Mile Rock and to the seaward. It is about 30 min out of Dunmore East. With depths in the range of 20-45m, an excellent dive. Same type of rock as Three Mile Rock. With both of these dives you can get a Westward run on the surface during half tides. In these areas the sea is nearly always a little "lumpy". Experienced divers only. A beam trawler built in Belgium in 1964 Nett 86 Tons length overall 25 meters. This vessel was scuttled under licence and has been colonised with a variety of sea life. Although the wreck is very broken up now due to movement in stormy weather there is as much to see on the sea bed here such as lobsters & crayfish in the rockie gullies. Distance out of Dunmore East is 30 min. Depths are in the range of 25-30m. Local sub aqua clubs leave a shot on this wreck. A very nice introduction to wreck diving. Experienced divers only. On 12/7/1917, she was escorting the oiler SS Wylie from Queenstown to Milford when she blew up with the loss of 11 of her crew. Reports taken from the sole survivor, who was picked up by a fishing boat, indicate that a mine detonated amidships and he was blown clear into the sea. The wreck lies in Waterford Harbour in 23m of water West of Hook head in two pieces. This is a lovely spot for an afternoon dive as the relatively shallow depth means that a great deal of time can be spent without excessive decompression penalties. For the last 15 years John has explored offshore wrecks. Here are just a few of the ones we regularly visit, the list is endless and many to this day still don't have a name. We normally cover the area from Tuskar Rock to Mine Head. We are however happy to go further a-field if required. submarine UC-48 when 19 miles W. by N. of Coningbeg lightship on March 17th, 1917 when on route from Para for Liverpool. Fifty-five persons lost their lives. The captain was among the survivors. A ship of 6446 tons, 127 meters long lying in 54 meters and rising 7 meters off the sea bed. Very popular with local sub aqua clubs. There is lots to see and explore inc. a large gun on the aft deck. Advanced Divers. The french regristered barque, on passage from San Franscisco to falmouth & Runcorn was sunk after being captured by a german submarine believed to be U-70, Constructed of steel she was 84 meters in length. Gross Tonnage 2248 t. Cargo of barley. A nice easy dive for the advanced diver. Depth to seabed 65 meters wreck rises 8 meters. The SS Etal Manor was a 1,875grt British Merchant steamship.She was built in 1916 by J.Crown & Sons Ltd., Sunderland. On the 19th September 1917 when on route from Barry for Queenstown she was torpedoed by German submarin UC-48 when 7 miles S by W from Hook Point, Waterford, 6 lives lost including Master. Owned by J. Fenwick & Son, London. She lies in 67 meters rising 10 meters off the sea bed. An excellent dive for the experienced Technical diver. Le Havre. This wreck lies in 64 meters rising 8 meters off the sea bed. Lots to see and do here for the experienced diver. Look out for the train axles, copper ingots brass bars etc. of fish life, congers, bib, whiting and pollack. HMCS Vervain was a Flower-class corvette of the Royal Navy. On 20 February 1945 at 11.45 hours HMS Vervain was escorting a homeward-bound convoy when she was sunk by a torpedo from the German submarine U-1276, under Oberleutnant zur See Karl-Heinz Wendt about 25 miles south-east of Dungarvan. 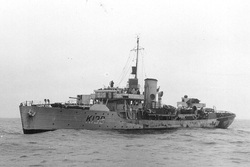 Shortly afterwards on the same day U-1276 was attacked by HMS Amethyst and a Liberator Aircraft (callsign Uniform) of No. 224 Squadron RAF, who between them depth charged the U-Boat until it sank with all hands. U-1276 lies close by. HCMS Vervain lies upright in 76 meters and rises up 5 meters with a 10 meter colum of encrusted trawl net.